the 80’s. 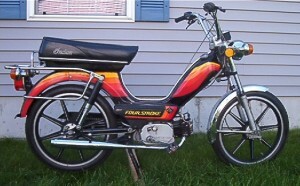 All had Sport Mag II or spoke wheels. I am the real Indian. No, I am the real Indian. 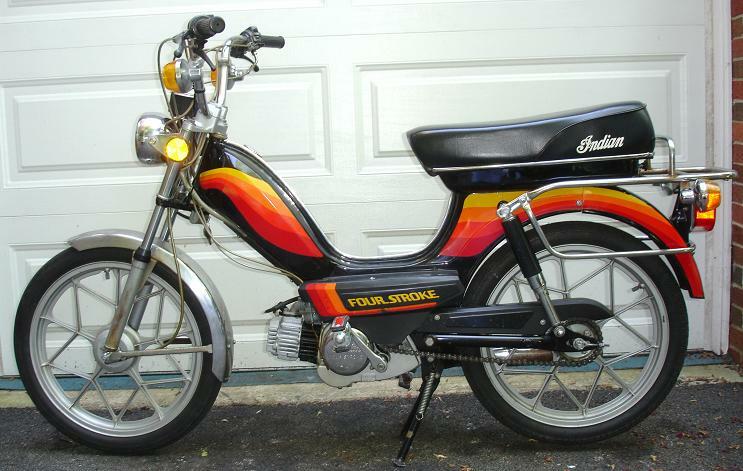 Partial History of the Indian Four Stroke Moped: Around 1977 American Moped Associates (AMA) purchased the Indian trademark from bankruptcy court for $10,000. AMA designed the frame, bought the tooling and rights from Honda, and got Merida to produce it. 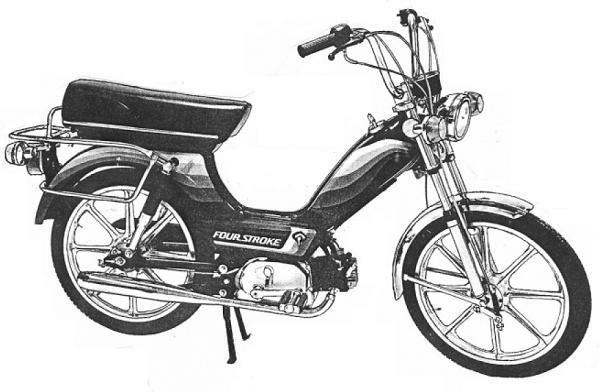 Excerpt from Mark Daniels “The Fall” article: Across the East China Sea in Japan, Honda had decided to discontinue its old four-stroke mopeds and replace these with new two-stroke models. 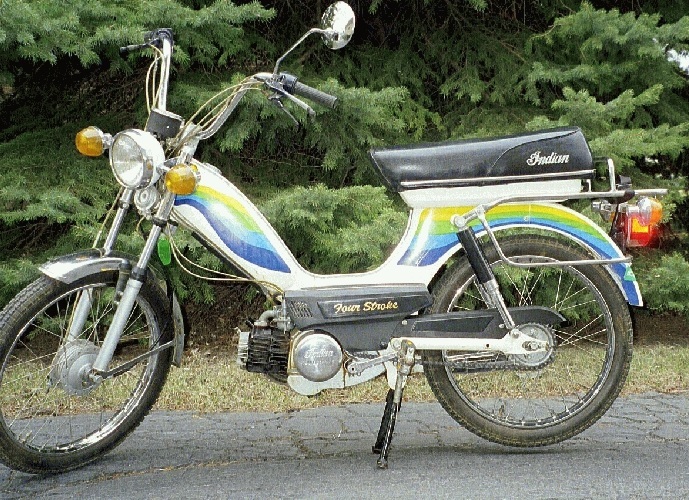 Following a 10-year production run, the PC50-K1 was pensioned off in February 1977 … but the engine design and a number of cycle ancillary components were licensed on to AMA to manufacture again at their Merida factory in Taiwan. 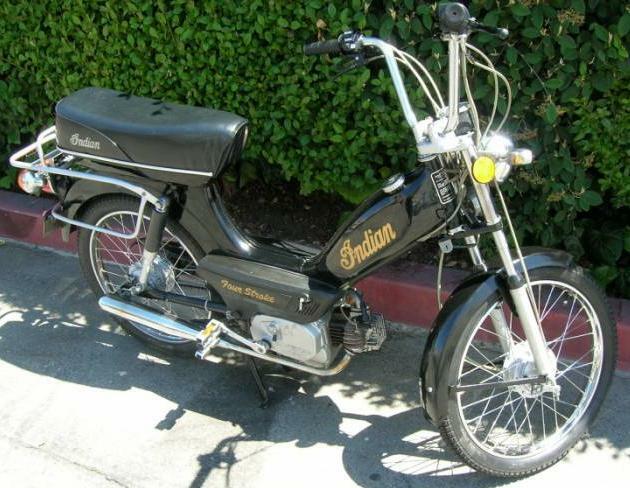 The result was the Indian AMI–50 ‘Chief’, which first appeared on sale in 1978. Now it’s fairly obvious there are some people who’re going to say this is just a PC50 come back to haunt us, but it’s really not! 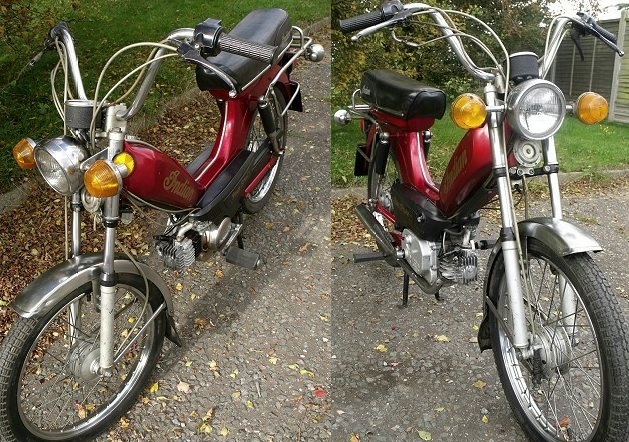 The engine is clearly a mirror design, but absolutely everything has been re-made, and not a single original Japanese Honda PC50 component or fitment has been employed. It’s a completely new motor manufactured to the licensed blueprint, and everything is different. 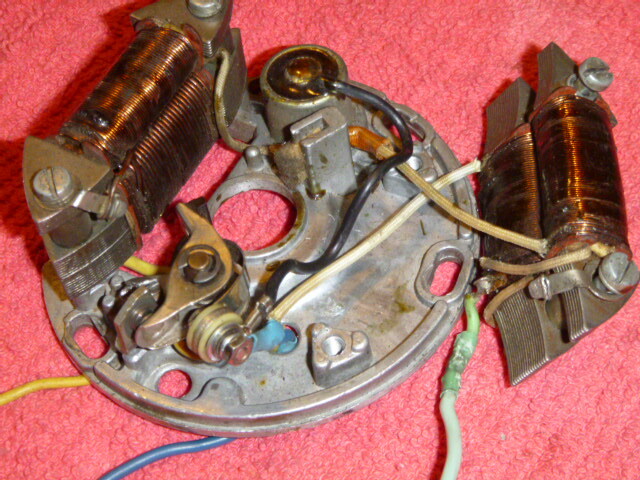 American Moped Associates had many accessories made with the Indian name, Indian saddlebags, Indian tools, Indian batteries, Indian carburetor cleaner, Indian cable locks, Indian shirts, Indian belt buckles, Indian patches, Indian decals, Indian lighted signs, Indian banners, Indian bin box labels, even Indian tires (made by Cheng Shin), and the optional aluminum 8-ray wheels made in USA by Sport Mag II. 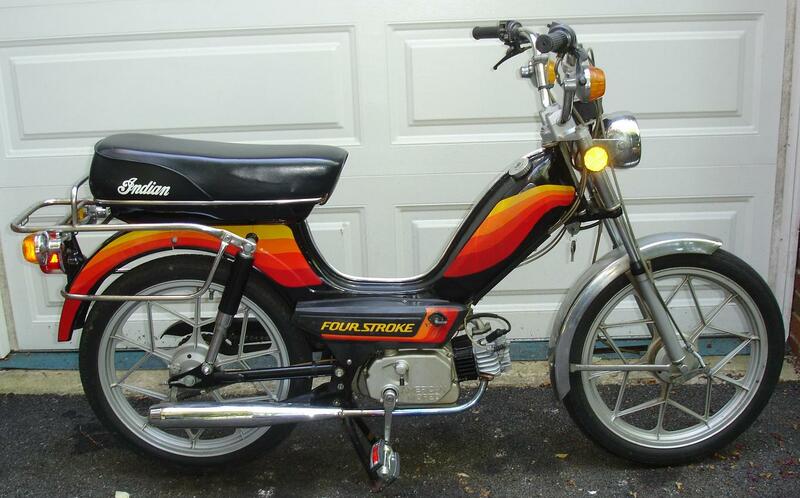 AMA had planned a 2-speed transmission for the 1981 redesigned Indian mopeds, but it never came to be. 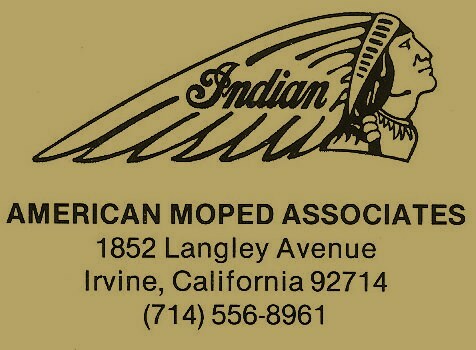 American Moped Associates, at 1852 Langley Ave, Irvine CA 92714, sold out to Carmen Deleone and his Leone Accessories company in 1982. 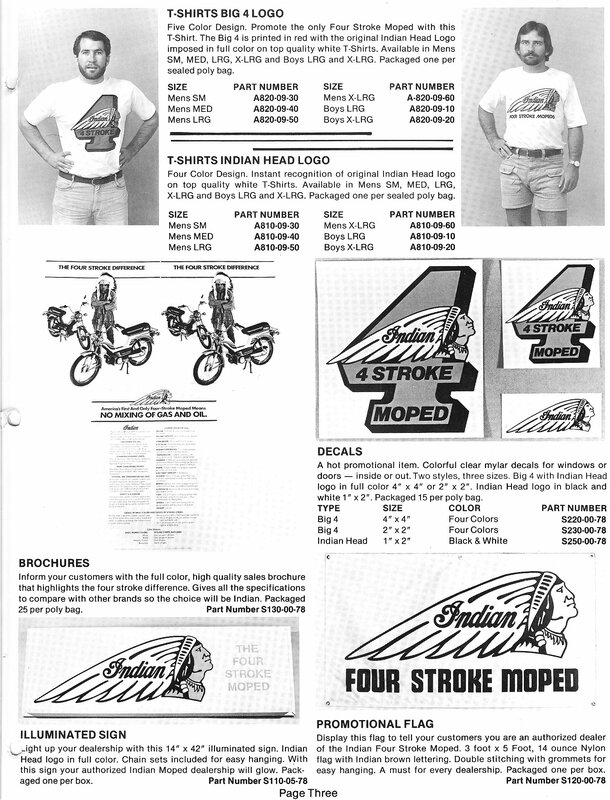 Leone Accessories had Indian saddlebags, Indian boxes, Indian shirts, Indian belt buckles, Indian patches, Indian decals, and the optional aluminum 8-ray wheels made in USA by Sport Mag II. 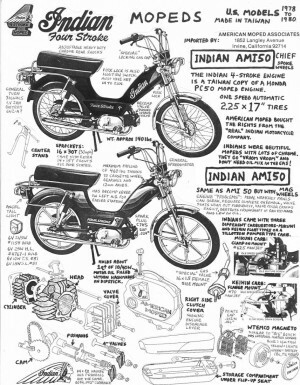 Carmen Deleone only bought American Moped out for the use of the Indian name, as the mopeds were sold down and not produced. 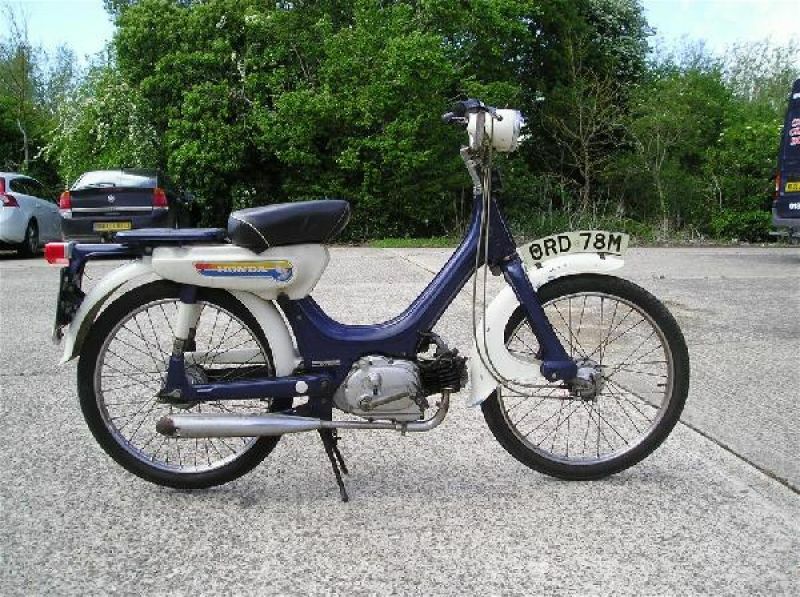 That’s why there are no 1982 or later Indian mopeds. 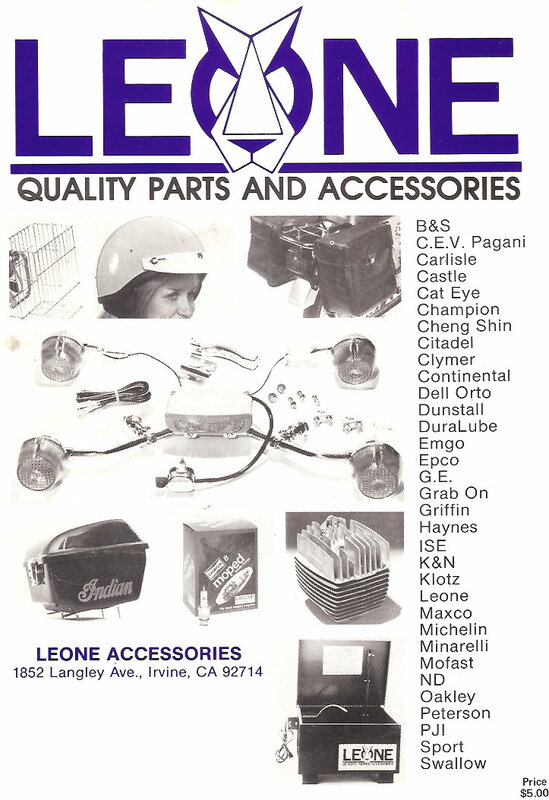 Leone Accessories, about a year later, acquired Derbi Motor Corporation of America (DMCA). 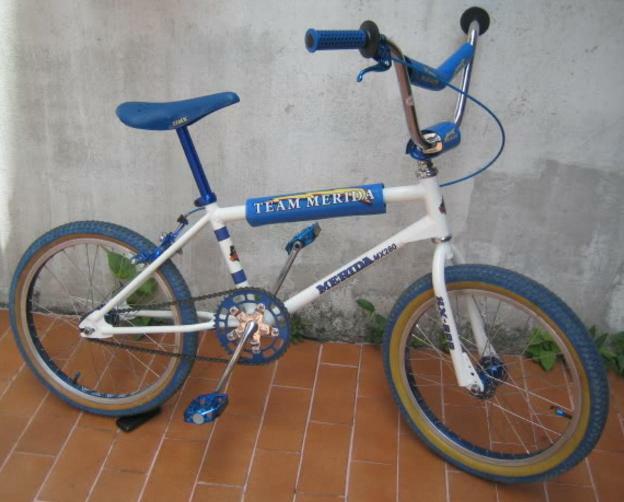 See Derbi Parts for more info on that. 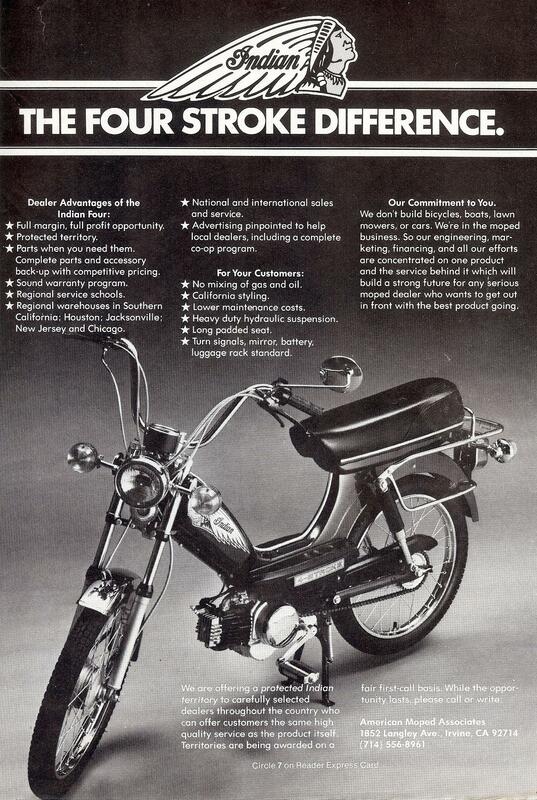 While the wholesale sales of Spanish made Derbi mopeds went well, DMCA’s plans for a new Indian moped and full size Indian motorcycle for 1984 failed miserably. 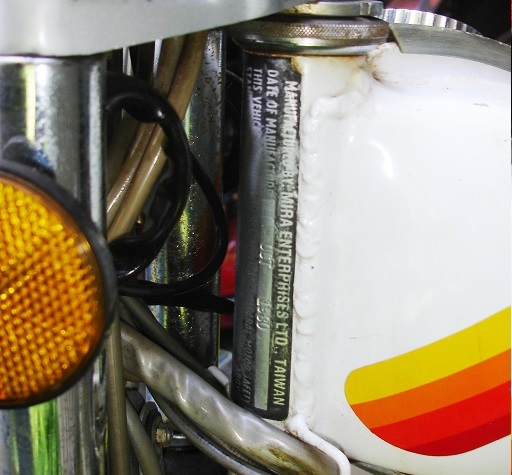 A few Manco go-karts were sold with “Indian 4-stroke” stickers affixed. Then the Indian name was sold off. 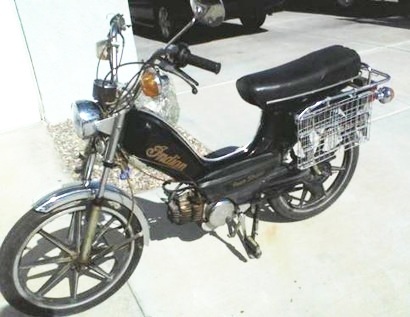 DMCA continued to import and distribute Derbi mopeds, made in Spain, to USA moped dealers, and to supply Indian moped parts and accessories until 1989-90. 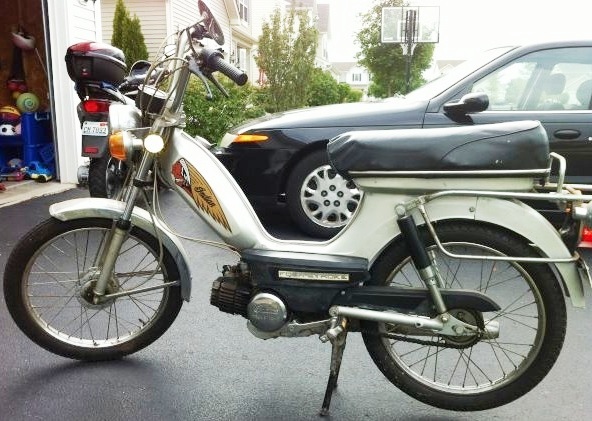 This motocross bicycle fork looks like the moped fork. Merida Indus try Company was started in Yuanlin (Taiwan) in Sept 1972 by Ike Tseng (1932-2012). Ike was annoyed at the poor quality of Taiwan made bicycles in 1971. It was so bad that some American bike shops at the time refused to repair Taiwan bikes, because they would not stay fixed. Pedal hard and the pressed-together DNB rear 10-speed hub would twist, throwing the rim out of true. Much of the steel was soft and weak, so on threaded things, even normal tightening would strip the threads. Ike Tseng was smart enough, as both an engineer and a business person, and determined to improve the quality of Taiwan bicycles. He also had connections in the US. 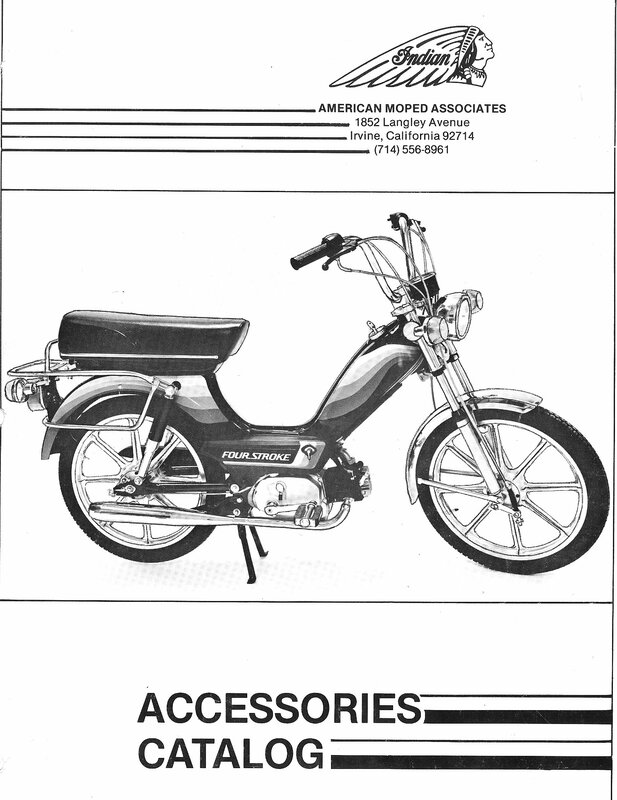 Who ever started American Moped Associates probably knew Ike Tseng and/or his high-quality-Taiwan-bicycle company. Excerpt from http://www.merida.com/en_int/about-us-94.html, what “Merida” means, as told by Michael Tseng, current CEO and son of Ike Tseng: The man whose life motto was “move with passion and courage” chose the name “Merida” intentionally: The rough translation of the three syllables “Me-Ri-Da” means that the company’s intention is to manufacture only beautiful and high-quality products enabling anyone to reach her or his destination as pleasantly as possible. Excerpt from http://en.wikipedia.org/wiki/Merida_Bikes: Merida Industry Co., Ltd (MIC) is a Taiwan-based bicycle design, manufacture, and sales company. It was started in 1972 by Ike Tseng. The original layout was based on the Raleigh Nottingham factory as Merida began by making Raleigh bikes for the North American market. Ike was a very talented engineer, and the company grew as a well-respected OE manufacturer making many well-respected brands. Ike died in January 2012, the company is now run by his son Michael Tseng. Merida is a gl obal player in bicycle design and manufacturing, making 2.2 million bicycles a year at 5 factories: 1 in Taiwan, 3 in China and 1 in Germany. As at 2012 the company is a public listed company on the Taiwanese stock exchange, quoted at approximately £350 million, making it one of Taiwan’s biggest companies. Merida now produces mainly its own Merida-branded bikes, which are present in 67 countries around the world, or selected brands which it has a financial interest in, e.g. the German brand Centurion. In 2001, Merida bought 49% of Specialized for a reported US$30 million, although its CEO and founder Mike Sinyard remained majority owner. Merida has been co-sponsor of the Multivan Merida Biking Team, with athletes such as Jose Hermida and Gunn-Rita Dahle Flesjå, and of bicycle racing events such as the TransUK and TransWales mountain bike races. Since 2004, the team has been scoring over 30 World Cup wins as well as Olympic gold and silver medals. In 2013 Merida became co-sponsors of the Pro-Tour Lampre-Merida road racing team. The history of Indian began two centuries ago in 1897. Read Mark Daniels excellent article “The Fall”, the full history of Indian, at http://www.icenicam.ukfsn.org/articles5/art0084.html. This is the best Indian History article ever! 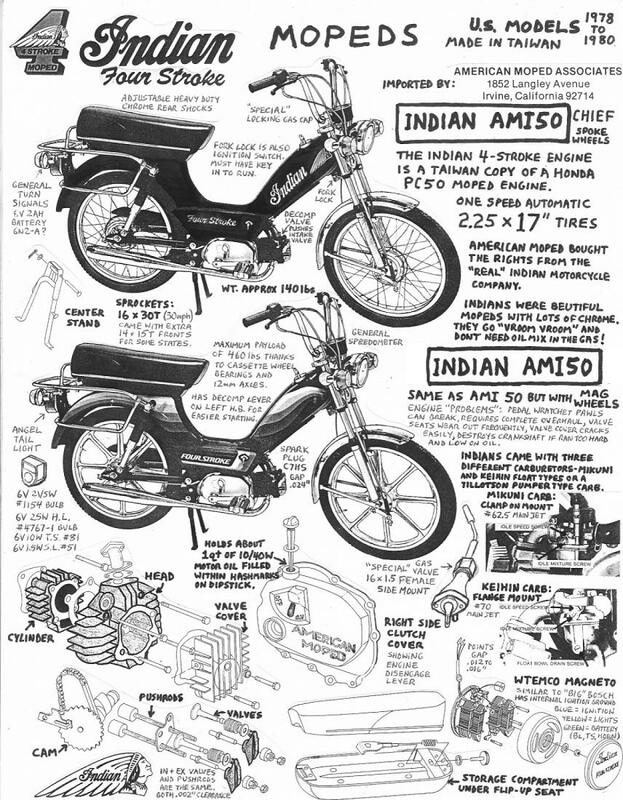 All Indian mopeds have the same model name, “AMI-50 Chief”, or just “AMI-50”. The service manual cover mentions a “AMI-50 2S”. 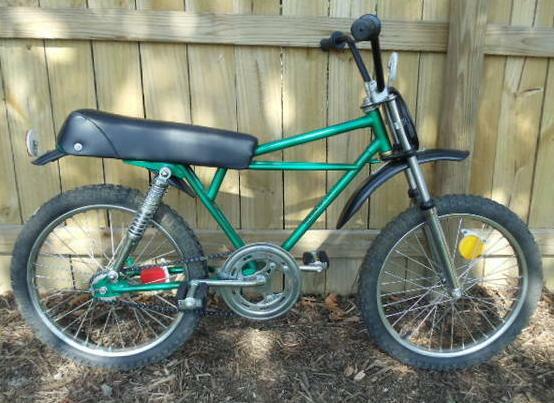 This was the 2-speed that never materialized. 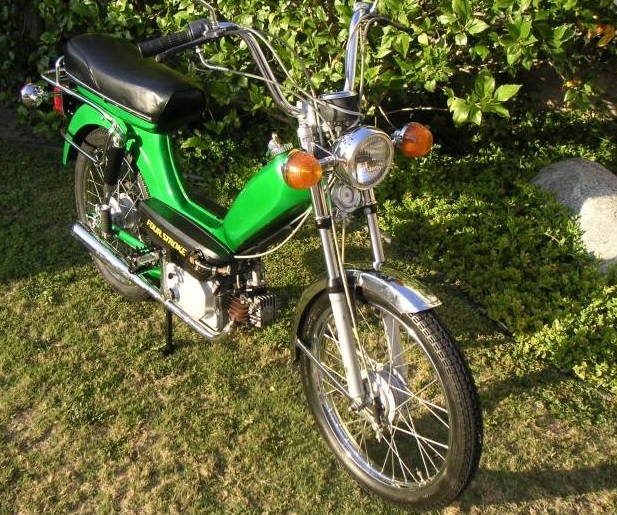 The 1978-82 Indian AMI50 engine is a remake of a 1975-77 Honda PC50K1 or 1975-78 Honda PF50R engine. 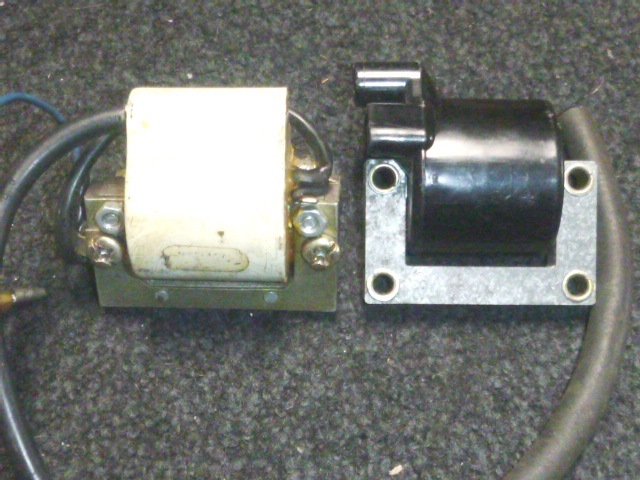 The main difference is the Indian left case has Bosch-compatible stator plate mounts. Honda has no stator plate. 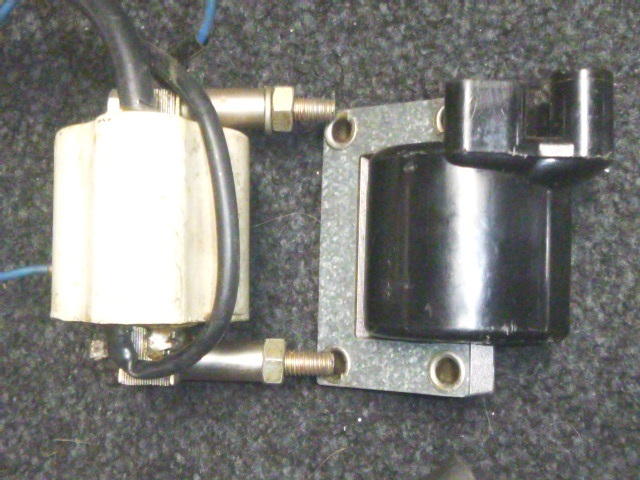 Other than the magneto-generator, and the Mikuni version head and intake, everything else is interchangeable. Indian models are like a fast food restaurant menu, many variations from just a few ingredients. 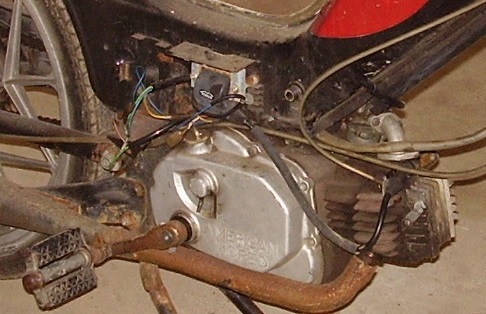 The first 1978 Indians had a Tillotson “pumper” type carburetor. That had problems. 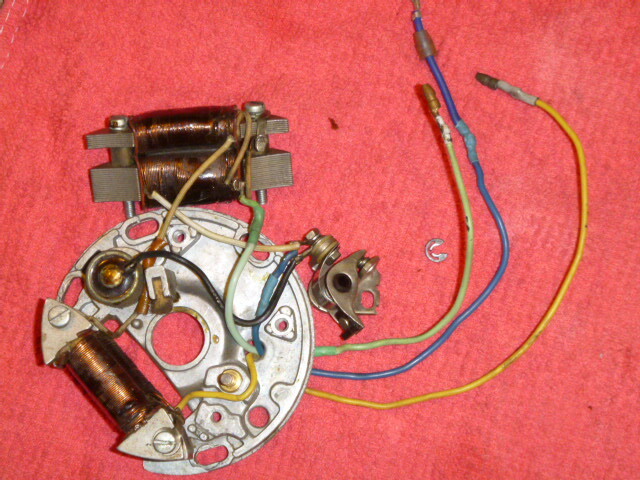 Later 1978 Indians had a Keihin carburetor, with lever choke, same kind as Honda PC50. 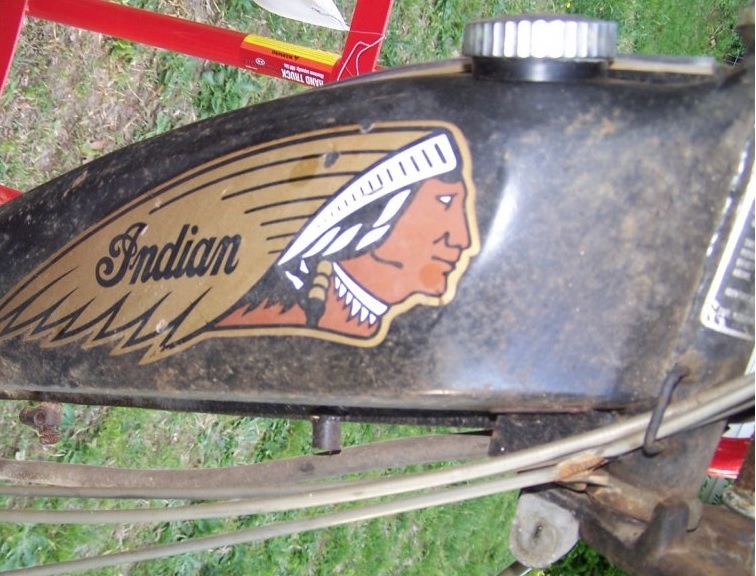 The only 1978 decals listed are the left and right Indian heads on the tank. The only 1978 wheels are the spoke wheels with 90mm brake drums. 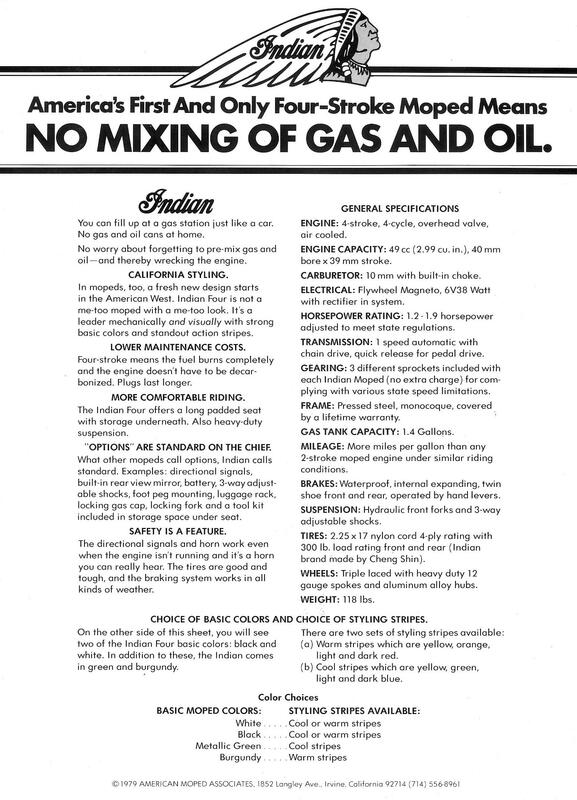 The 1979 Indian Parts Manual lists the following frame colors: black, silver, burgundy, blue, green, white. 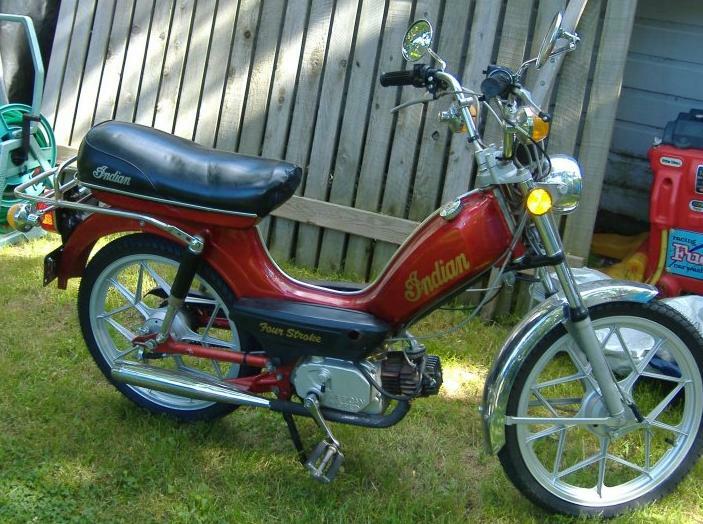 The 1979-later Indians had a wider rear luggage rack. 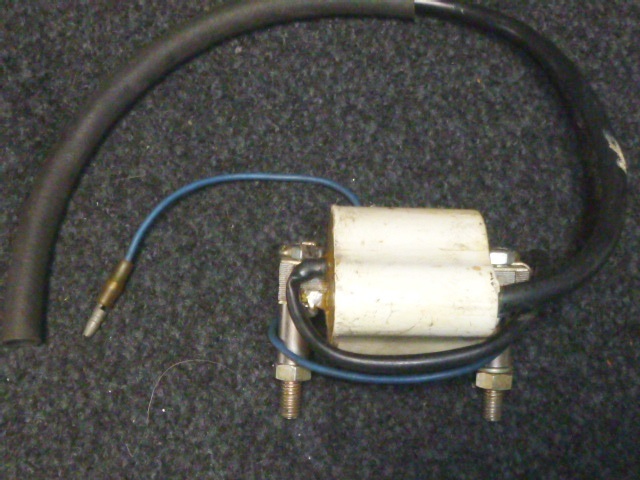 Some 1979, and all 1980-later had a Mikuni 10mm carb, with cable choke. The cylinder head for the Mikuni carb model has a different flange angle, and maybe upgrades to valves? 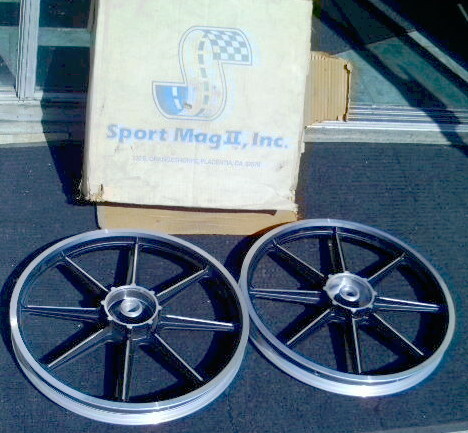 The 1979-later Sport Mag II aluminum wheels have the same 90mm brakes as the spoke wheels. The 1979-later Mira Enterprises aluminum wheels have 100mm brakes, different than the others. “Script” version had gold script Indian decals on the tank, and gold script Indian on the engine covers (sides). “Stripe” version had either “warm” or “cool” color stripes, and “FOUR STROKE” in yellow slanted on the sides. 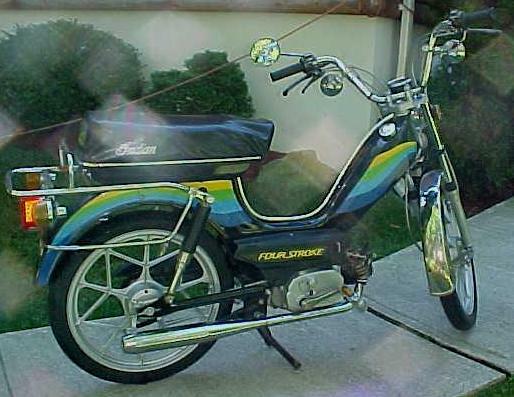 The 1980 Indian Parts Manual lists the following frame colors: black, silver, burgundy, blue, green, white. 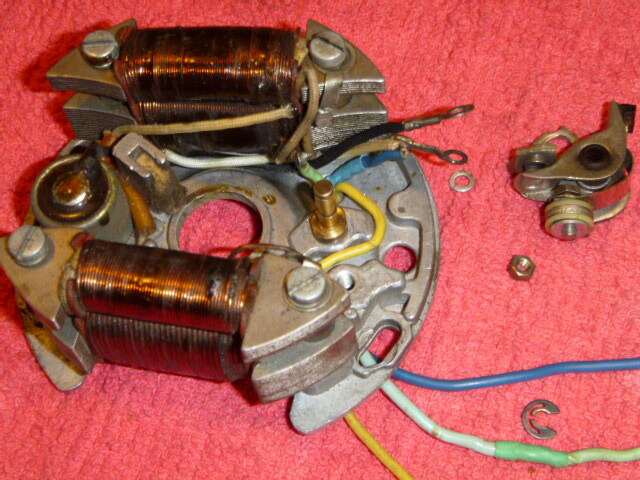 Some 1979, and all 1980-later had the improved two-coil WTEMCO magneto. See Wiring Diagrams for that. 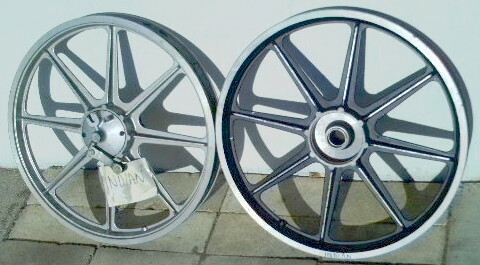 Some Indians had Sport Mag II cast aluminum wheels, made in Placentia CA USA, near Myrons Mopeds. 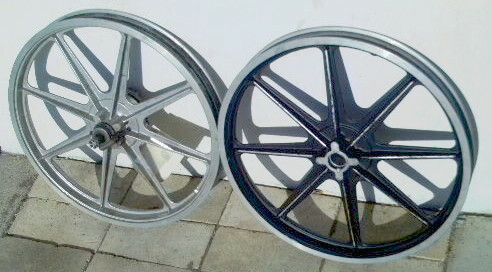 These were pretty much the only aluminum “mag” type wheel on any Indian mopeds originally sold is Southern California. 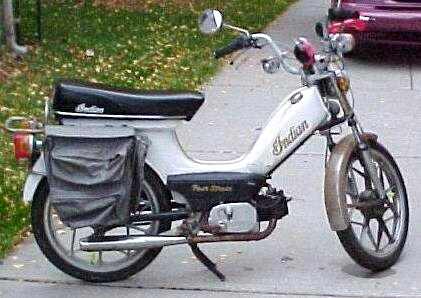 For the rest of the country, the Mira Enterprises (Taiwan-made) aluminum wheels, that look like snowflakes, are the most common type of Indian moped “mag” wheel. 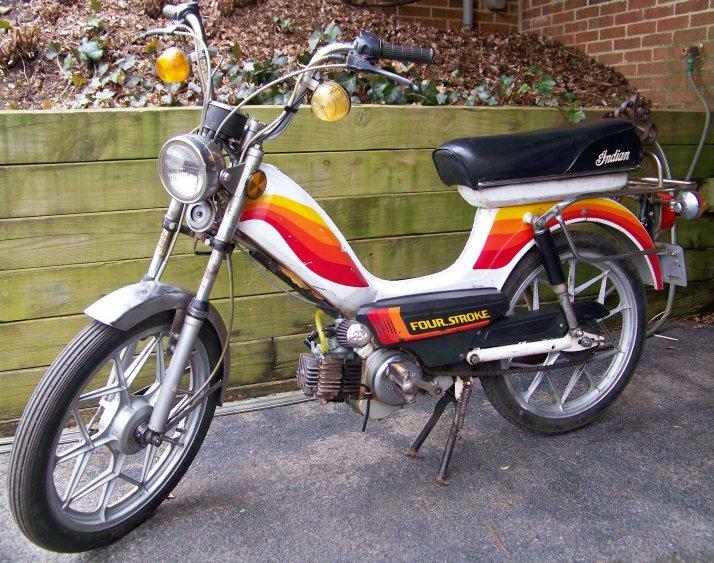 This is easy to see in a Google image search for “indian moped”. 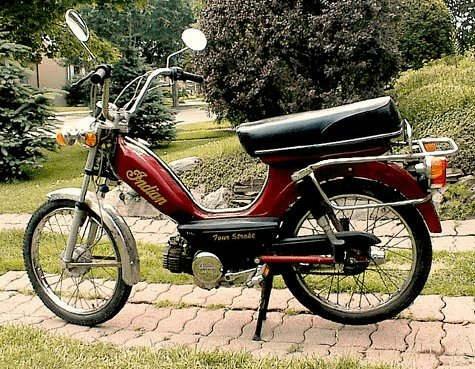 Maybe, this was because American Moped Associates, in Irvine CA, had to unpack the bikes and swap the wheels with the local-made aluminum ones (that need all the brake and axle parts transferred from the old spoke wheels). So they only sold units with Sport Mag II wheels to local deliveries, while for far away deliveries they would sell the units with Mira snowflake wheels. That way the packaging crate was undisturbed from Taiwan, and able to withstand another long distance shipment. What you see on opposite coasts of the USA is sometimes different, like these wheel styles. 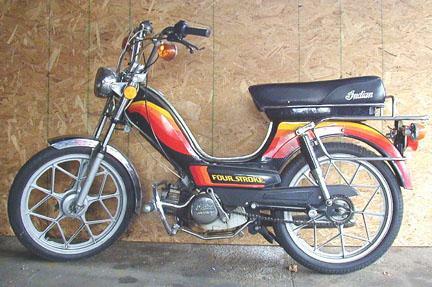 Sport Mag also made dual chain Puch and Peugeot 17″ wheels, and others. See Wheels. 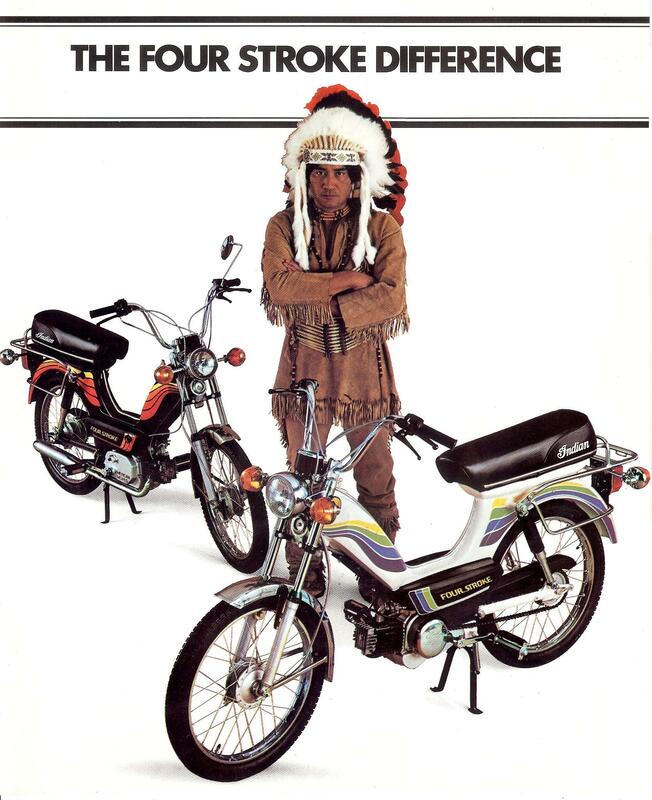 American Moped Associates was already proud that the Indian was American-designed. 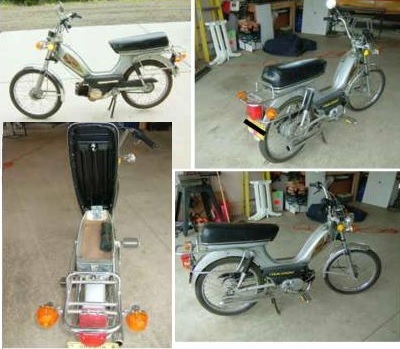 With it’s long bench seat, extra large 1.6 gallon gas tank, heavy weight carrying capacity, motorcycle type forks, and plenty of chrome it was an American moped. 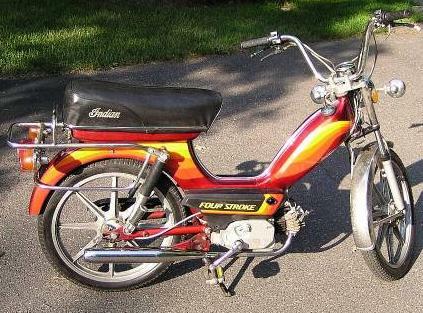 It was a pretty good frame with a classic moped design, functional and fun to look at. 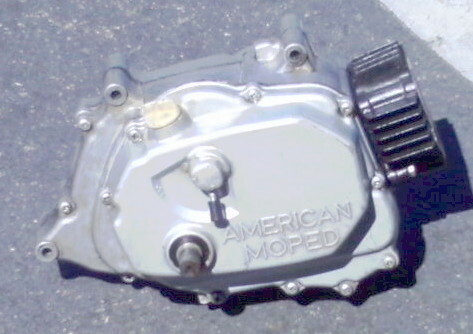 Now, with the USA-made Sport Mag II wheels, the product was almost living up to the company name, American Moped. 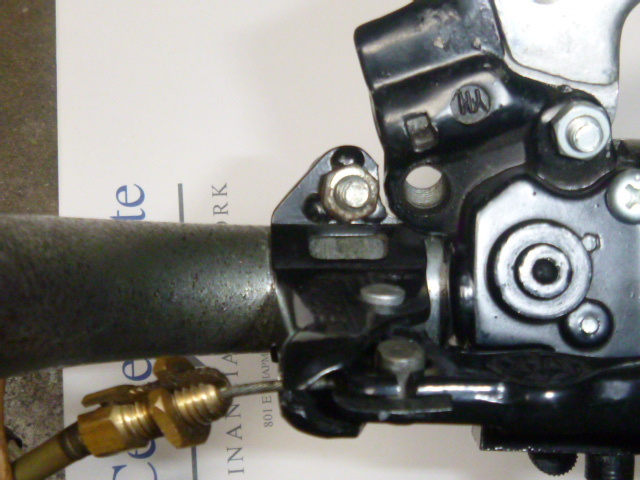 The Indian gas valve is a female M16x1.5 thread, side mount, with on, off, and reserve. The supply ran out long ago in the late 1980’s. 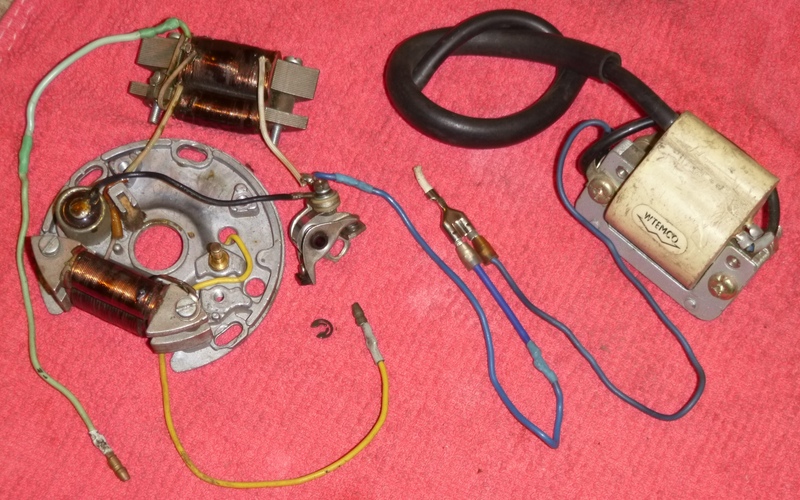 Here are some suggestions on how to adapt other valves, or repair the original one. 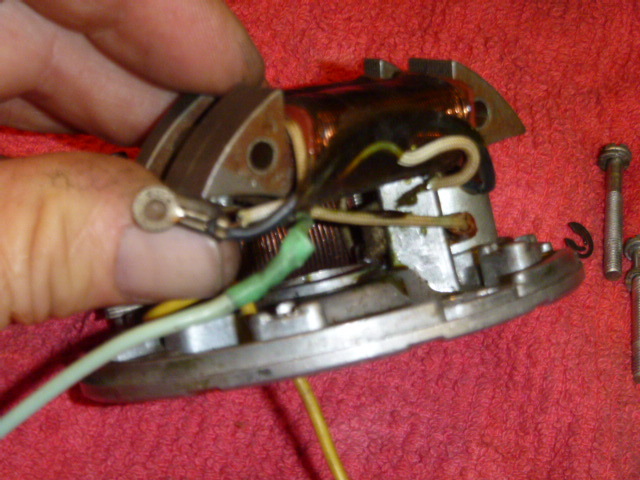 Replacing the inner seal disk: Usually the valve is good except it leaks or does not shut off completely, because the rubber seal disk is old and damaged (shrunken, hardened, or cracked). The remedy is a new rubber disk. 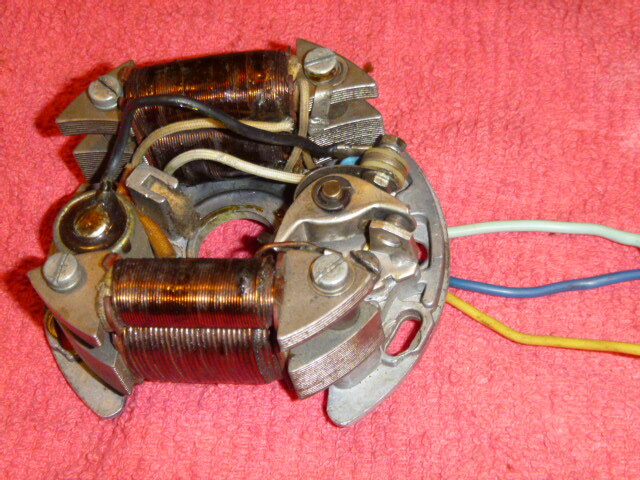 There is a Honda seal disk 16115-001-004 that will fit an Indian gas valve, but two of the eight holes must be widened. Substitute gas valve: The substitute gas valve was intended to be mounted vertically. It fits and shuts the gas on and off. But because it is mounted sideways, 1) there is no reserve capability, and 2) the side cover must be removed to reach the handle. 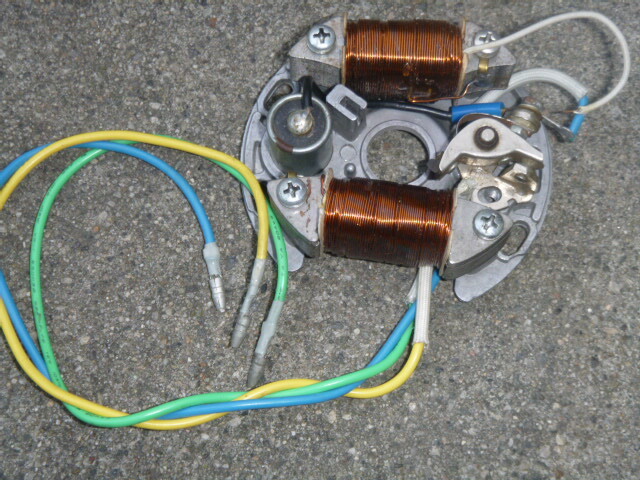 The three magneto wires exit through a hole in the aluminum case, at about the 2 o’clock position, surrounded by a rubber grommet. That is where they get flexed all of their lives. As the plastic wire insulation gets old, it gets hard and brittle, and then cracks. The places where the insulation cracks at then focus the flexing in to a small area, causing the copper strands to start breaking one by one. These wires were half broken and oxidized, just outside of the rubber grommet. They were repaired by cleaning the copper with steel wool, then soldering, then color coded shrink wrap. 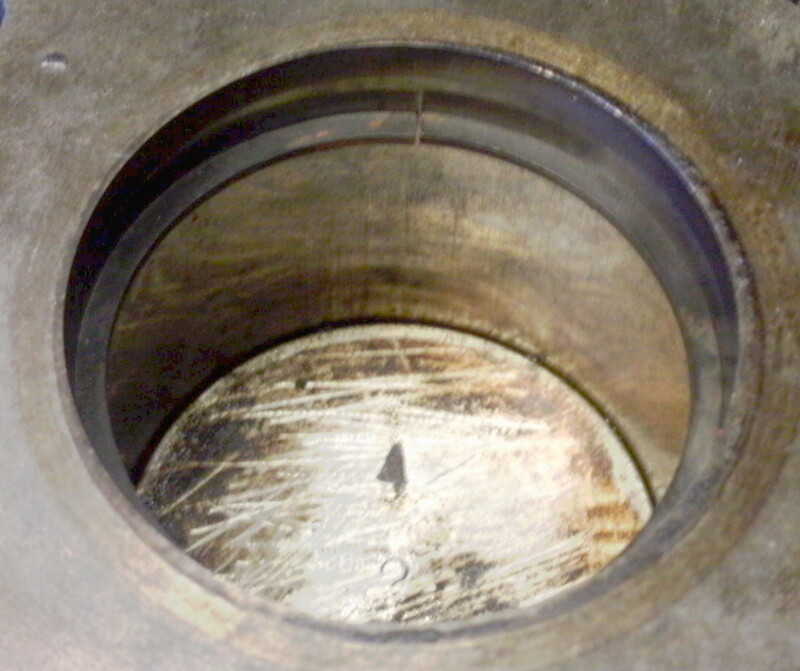 The repaired sections were placed on the inner side of the grommet, where they never have to flex, shown in photo 9 below. Indian Points Replacement: This sequence shows how modern (1970’s) Bosch one-piece points will substitute for the earlier (1960’s) Bosch three-piece points. 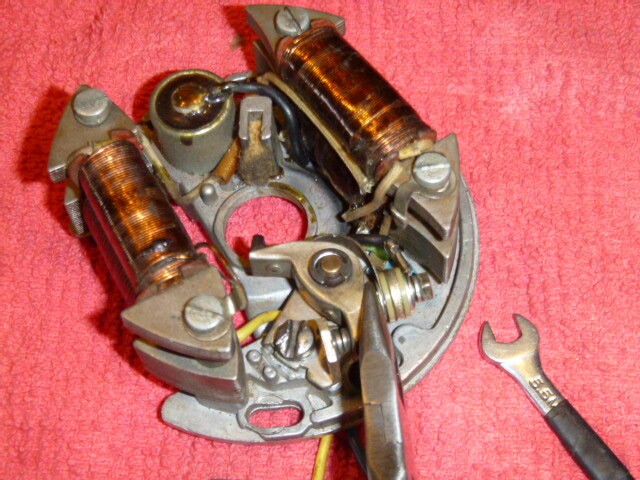 The pivot post unscrews from the stator plate. The modern points smooth post locates the pivot point precisely in the threaded hole. 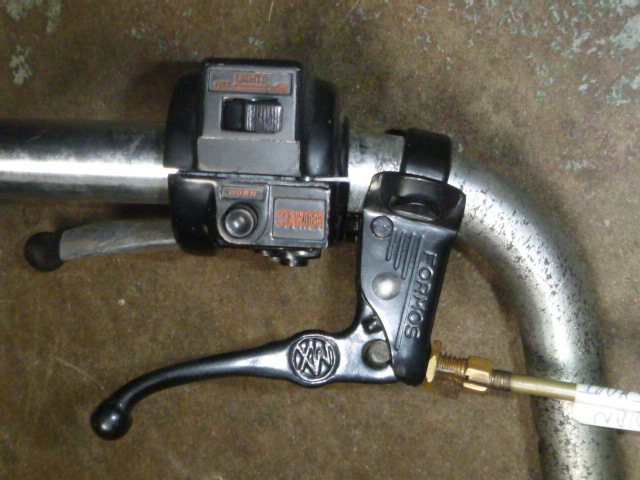 These are the same points and condenser as Puch, Batavus, Sachs 505, etc, because the WTEMCO magneto is Bosch-compatible. 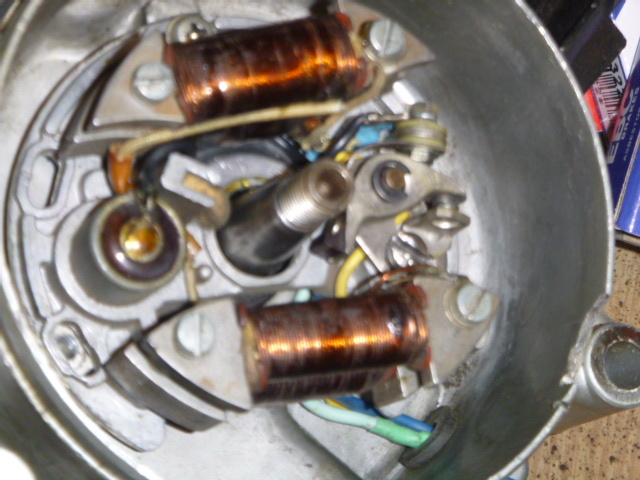 The individual coils and stator plate do not interchange with Bosch. 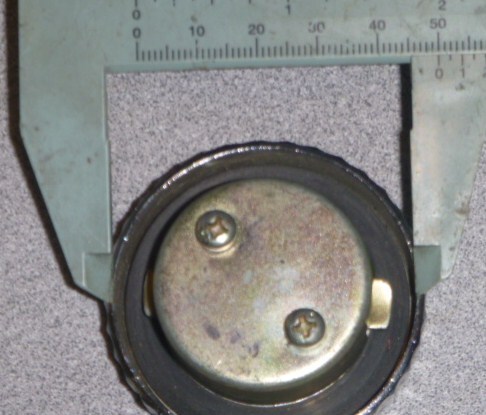 The timing angle of the points cam lobe in relation to the key groove, and the four magnets also have a timing angle in relation to the key groove. So many different Bosch flywheels will fit but only some will function. 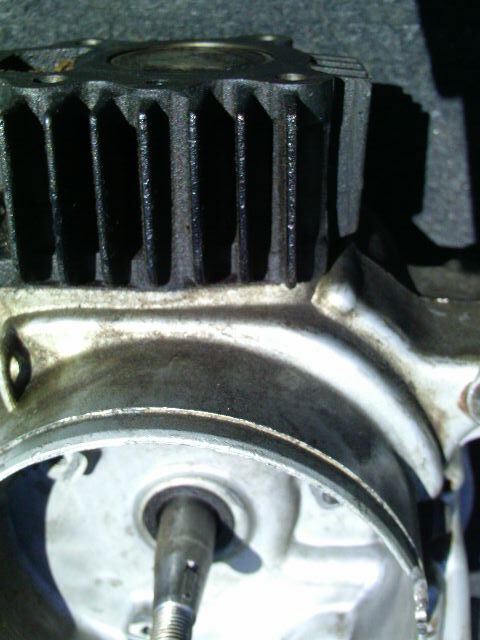 With the piston is parked at top dead center, the rod is in the 12 o’clock position, straight up in this view. 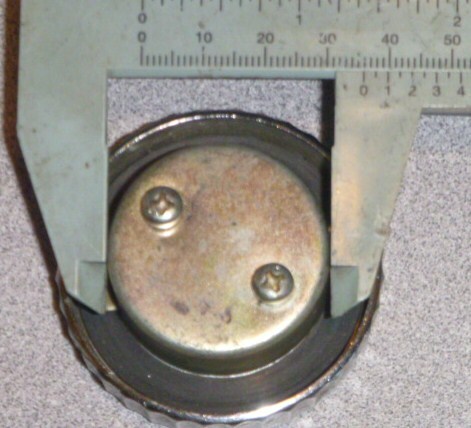 The woodruff key for the magneto flywheel is in the 1:15 position, or about 38 degrees. 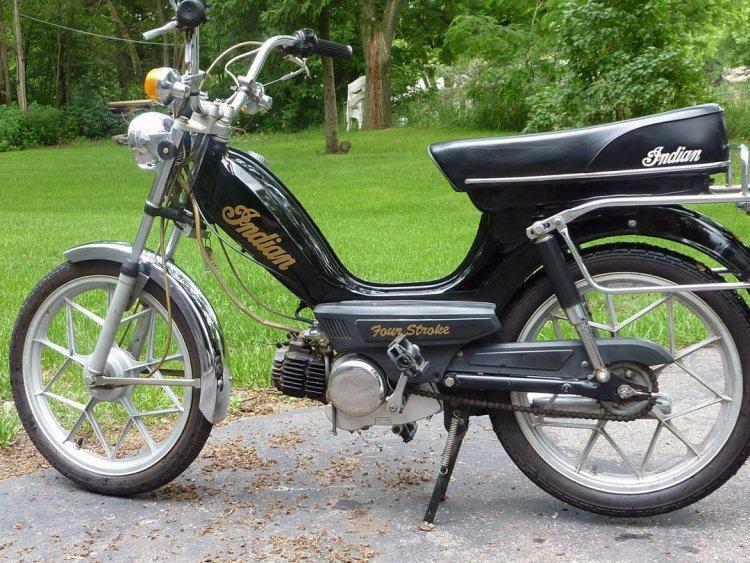 A Puch 1-speed crank has the same size and taper, but the key in the 12:00 position. 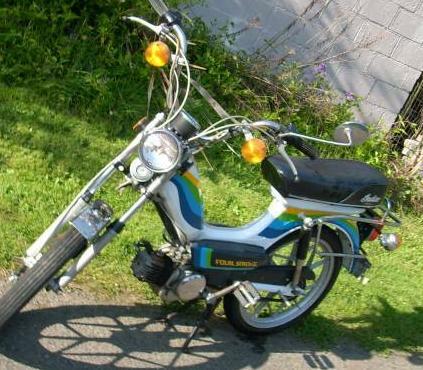 However, a Tomos crank does have the same size, taper and key position as an Indian. Too bad early Tomos magnetos are scarce because they get rusty from trapped water. 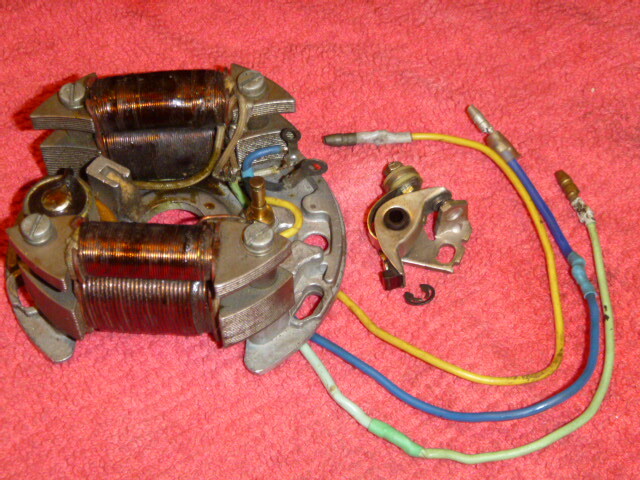 1996-2006 Tomos A35 CDI-ignition, with 70 watts of lights power, magnetos would substitute if the coil is changed to the Tomos A35 coil with CDI unit built-in. Here is an Indian engine, minus head and magneto. 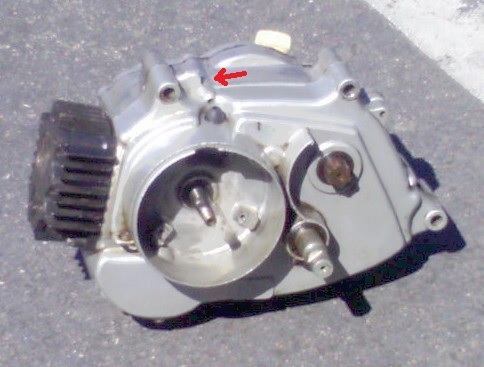 Red arrow is crankcase vent. Right, close up of the fresh cylinder wall. 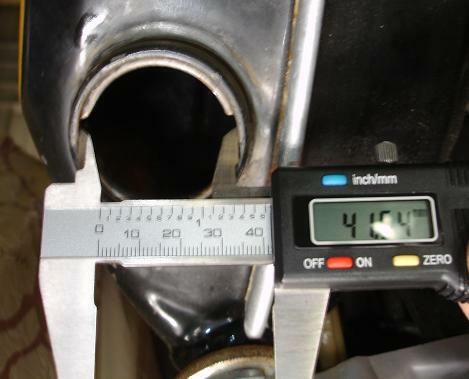 You can see the reflection of the marks on the piston crown on the exhaust side (back) cylinder wall. 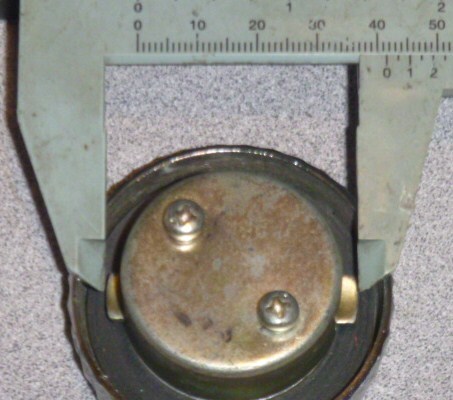 A new Indian 42mm ring with a gap of only 0.007″ shows there is almost no wear. The Wtemco coil bolt hole centers are 58mm apart. 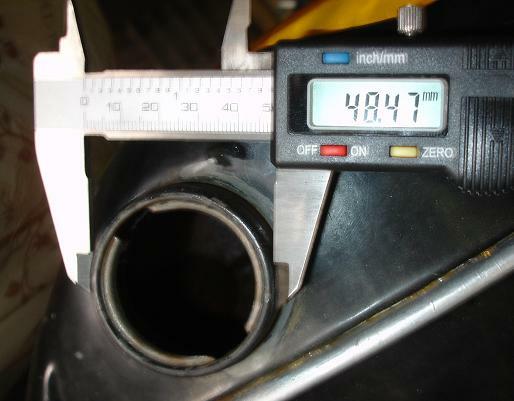 The Bosch coil holes are 53mm. That is not so bad, but the metal plates are taller. Since the Wtemco coil plates are already up against the floor plate of the frame, there is no room for a Bosch coil in the same location. It would have to be hung with one bolt, at an angle. Furthermore the Bosch bolt holes are for 5mm bolts, whle the Wtemco ones are 6mm. So a special step stud 5-6mm is needed. 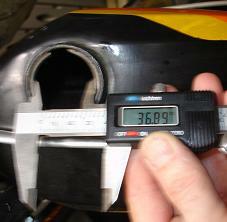 Fortunately there are some 5-6 step studs on a Motobecane, that are the correct length. 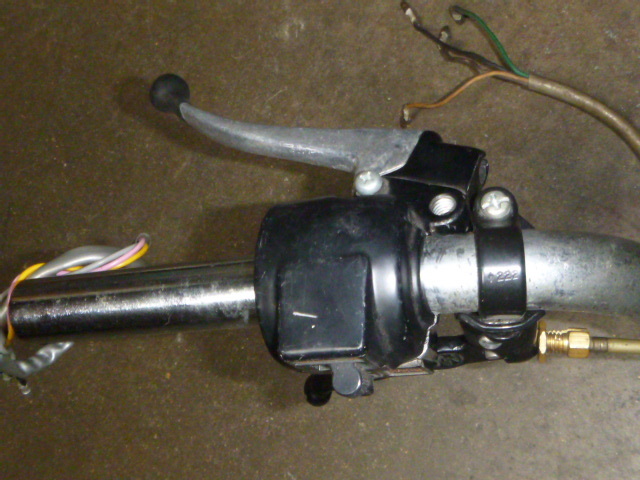 There are two kinds of Indian left controls, each with a different start (decompression) lever. 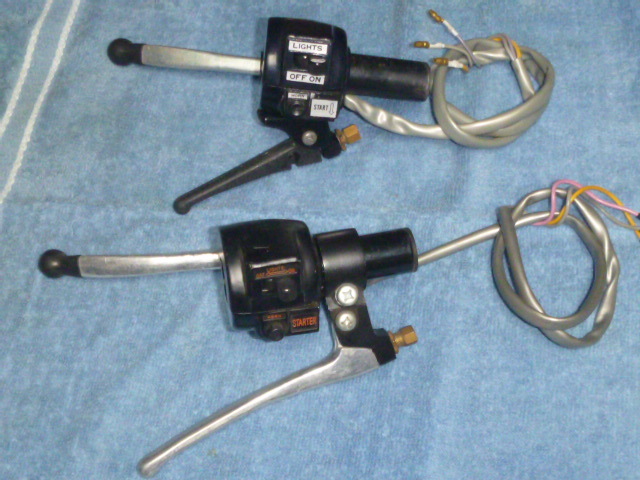 General fork lock (ignition) keys range from 7650-7689 and 7750-7789. 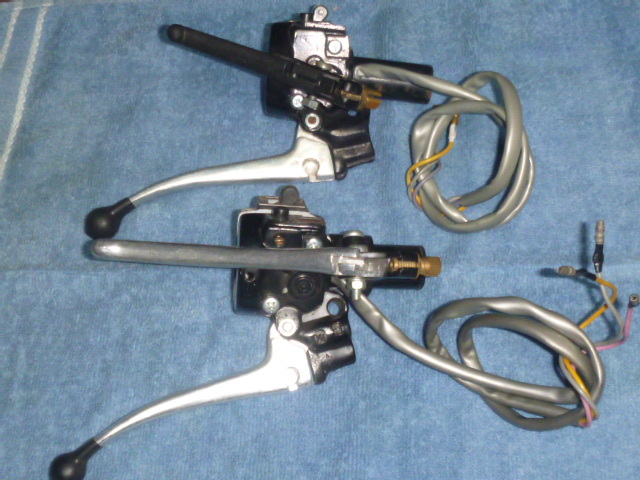 Indian fork lock (ignition) keys range from 5540-5546 and 7540-7546. You are currently browsing the archives for the Indian Info category.